It’s like a celebration day to most techies and Apple lovers too..! From the day I got to know about “Apple Event”, it’s a fixed day to have it on my calendar without any commitment whenever it hosted. The craze on the event is something else to me. I loved it to not miss it for the structured presenting, their way of debuting the next gen technologies and to have the excitement moments those breaks the rumors and brought something more than them. This year, the day of iPhone 7 launch which is most awaited especially for storming rumors on removal of headphone jack arrived on 07.09.2016. The September 7 with iPhone 7. It’s great nah..! OK.. move to the facts from here on. Tim arrived to Bill Graham Civic Auditorium, San Francisco in a Land Rover, having Carpool karaoke with James Corden all the way, caught Pharrell Williams also inside their ride. With the drop, Tim directed his steps to stage and with huge applause of crowd, he welcomed to open up the magical box on the floor to reveal the secret which the world waited to have. Tim opened up the session with statement of Apple Music and stated, “Since launch, Apple Music has grown to 17 million subscribers” which is considerably a great achievement to it. Further, he added about the 10th year of Apple Music festival. Also, about App Store, his statement was, “140 billion apps have been downloaded from the iOS App Store”. After Miyamoto from Nintendo gave his presence on the stage, a really surprised gift pack unwrapped as Super Mario will come to App Store with the name of “Super Mario Run”. It’s absolutely a “WOW!” moment and made me to tweet my thoughts on it. Waiting for the day to crawl.. OOPS! RUN & JUMP..!! The Super Mario Run will be not a freemium one and we need to open up our wallet to bring the boy to our screen. On this, my question is, “How much we want to pay? I’m reserving the money for it!”. Also, Mario iMessage stickers will be available with iOS 10. Then, Tim briefed about Apple’s effort on ConnectED program which support students on their education and said about the program “Everyone Can Code” which is a plan to make the student learn about coding. The session moved to iWork and the demonstration carried out about real time collaboration with live demo by Susan Prescott, the first woman presenter on Apple Event stage. After Susan’s session, Jeff Williams took the floor from Tim after his brief on Apple Watch which said as “Selling in just 8 months of 2015, we became the 2nd most popular watch brand”. Jeff opened up his talk about WatchOS 3 and its features such as quick swapping watch faces, animated stickers, upgrades on messaging, message effects, handwriting recognition, activity sharing among friends and family and one touch SOS which alert integrated phones and given SOS contact. Along with the session of Apple Watch, the arrival of John Hanke, CEO of Niantic (which brought Pokemon GO live to the world), triggered the crowd with applause as the announcement of Pokemon GO on Apple Watch. After gain the stage back, Jeff brought the announcement of next gen Apple Watch named “Apple Watch Series 2” and added Series 2 Apple Watch is swim proof which water resistant to 50 meters. Series 2 have dual core processor with 2X faster GPU, display with 2X brighter and built-in GPS. Apple introducing a new ceramic Watch band also. Apple Watch Nike+ also debut with the presence of Trevor Edwards, President of Nike. He said about “Are we running today?” which will alerts to try and motivate run in Apple Watch Nike+. With the announcement of availability of Apple Watch Series 2 on September 16th, 2016, the session of Apple Watch ended. Tim took the stage back for the most awaited moment, which the announcement of iPhone 7..! Tim’s statement on iPhone’s sale is, “Apple has now sold over 1 billion iPhones” and he added “It’s the best selling product of its kind in the history of the world”. Tim briefed about the features of iOS 10 such as iMessage improvements with excited upgrades, third party Siri integration, new “Home” app, raise to walk and some more. With the lead of iOS 10, he highlighted the need of advanced smartphone for such advanced mobile operating system which is, obviously the iPhone 7. While having a video of shiny black version of iPhone 7 and made up process of its body on the screen, Phil stated that polished metallic glassy iPhone as “Jet Black” version. Hopefully, it’ll spark temptation on many black iPhone lovers to go with this version as it’s seems the lovely body of iPhone 4 and 4s and most beneficially it’s a scratch resistant one. Other usual colours of iPhone 7 such as gold, silver, and rose gold also showcased. Along with the availability of features so far with the home button such as multitasking, access Siri, Touch ID and Apple Pay, this time the home button got upgrade with working along with Apple’s Taptic Engine which made the button not to click and feel it with press as like haptic touchpad of MacBook which recently added on it. This time you don’t worry to always keep an umbrella with you to keep your iPhone safe from rain. 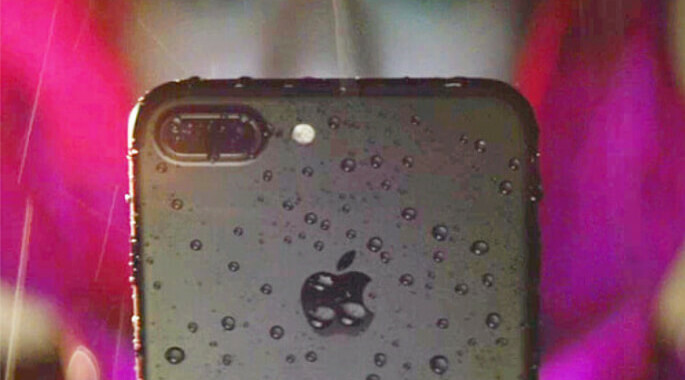 Actually you can took photo of raindrops via your iPhone 7 as it’s water resistant one with IP67 protection standard, a standard drawn up by the International Electrotechnical Commission (IEC) which certifying dust and water proof. It’s a biggest upgrade on iPhone 7 especially on iPhone 7 Plus with the availability of dual lenses which one is wide-angle lens and another is telephoto one to bring the object closer to you via zooming. The telephoto lens enabled a 2X optical zoom and after that with support of software, provided 5X and 10X zoom as well which is not even worst and brought high quality photos even on 10X zoom. The upgrade on camera brought a new mode on iPhone 7 Plus called “portrait” which brought “shallow depth of field” within a phone which otherwise needed a DSLR to produce such snaps. It’s really a lovely upgrade on iPhone camera. Also, the front powered with a 7 megapixel Facetime HD camera. WAIT..!! something shockingly said by Phil. YES!, to generate a photo on iPhone 7 when you click the shutter button each time, it’s done over 100 billion operations to compile a single image. Is that not a shock? It’s more shock that all those processes were done within just 25 milliseconds..! Is Apple became as a super computer? Who like to hear music via only one ear? This time, the upgrade brought Stereo speakers to iPhone. More than that 2X louder which will trigger a dance party with an iPhone 7. What about the most discussed rumor on the internet for recent months? The removal of headphone jack from iPhone 7. Yep! It’s actually happened as rumored and Apple done it and put a full stop to speculations. This is not a first time Apple taking this kind of decision which a part of people not like and obviously will open up the path to next gen. In Apple’s history, no support to Adobe Flash on iPhone, iPod and iPad; Removal of DVD drive from MacBook; Availability of USB-C port only on MacBook are some examples those criticized initially and later accepted and copied or try to copy by rivals. Hope, Samsung almost assembled a research team to produce a Galaxy SOMETHING without headphone jack. It’s just joking as actually this what happening in reality as many knew. With removal of headphone jack, EarPods can be connected to iPhone 7 via lightning port and Apple announced a Lightning-to-3.5mm adapter also will available with the box which not let anyone to throw their old headphones. Under this upgrade, Apple debut it’s ever first wireless headphone device called “AirPods”. It’s also a great upgrade from Apple which made us to safeguard from this irritating wired device which wrapped our body which sometimes not making us to freely move our hands. The storage box of its also the charger and with just the cap open of the box, the AirPods will get paired with iPhone, iPad, Mac or Apple Watch once the AirPods set-up on a device, via iCloud sync, it’ll get work with all connected devices. Infrared sensors on the AirPods made it to play the music only when they’re on ears. Double tap on the AirPods will activate the Siri. Per charge, it’ll play up to 5 hours and with dual mics, you can be hands free. A chip called “W1” embedded on the AirPod to facilitate the wireless functionality. The NFC technology called “felica” in Japan added with Apple Pay which enable Japanese to use Apple Pay in Japan. Hopefully, it’ll increase Apple’s sale in Japan. This time, iPhone powered with a chip called “A10 Fusion”, which has a four-core CPU, two high-performance CPU cores and two “high efficiency” cores that run at less power to save battery life. The chip is 40% faster than the A9 on the 6S. The GPU of iPhone 7 is 240x faster than the original (first) iPhone. Also, iPhone 7 line-up stated to offer better battery life than its predecessors. Am I forgot to say another most needed upgrade on iPhone 7? YES..! and thatz 256GB iPhone 7 and iPhone 7 Plus. Just WOW..!! Pre-orders opened from September 9th, 2016. Shipping starts from September 16th, 2016 which the day raised long tail queue on Apple Stores and iOS 10 can be upgrade from September 13th, 2016. Later, Tim’s presented on stage and thanksgiving to all those who behind the success of Apple and to brought such crucial tech gadgets to the world. Lastly, with Sia’s live music performance on the stage, live stream comes to an end while reporters presented on the arena moved to get the hands on experience on the devices debuted on the stage..!